Research suggests apps simply free our minds to focus on other things – rather than making our memories lazier. Smartphone apps allow us to outsource remembering appointments or upcoming tasks. It’s a common worry that using technology in this way makes our brain’s memory capacity worse, but the reality is not that simple. In fact, these platforms can be useful, not only for people with memory impairments, but also the general population. Over two studies, we set out to explore the potential of smartphones as memory aids by investigating how people with traumatic brain injuries (TBI) or with stroke use them. We surveyed 29 people with TBI and 33 non-injured people for our TBI study. For the stroke study, we surveyed 29 participants with stroke and 29 with no history of neurological conditions. We found that memory apps like calendars can be helpful for people with brain injuries. And while it was a small sample, we also found that for participants without brain injury, there was no relationship between memory app use and memory ability. This finding requires further analysis, but it is not consistent with the idea that memory aids make our brains lazy. Rather, such apps can free our minds to focus on other things, without using up mental resources worrying about what needs to be remembered. 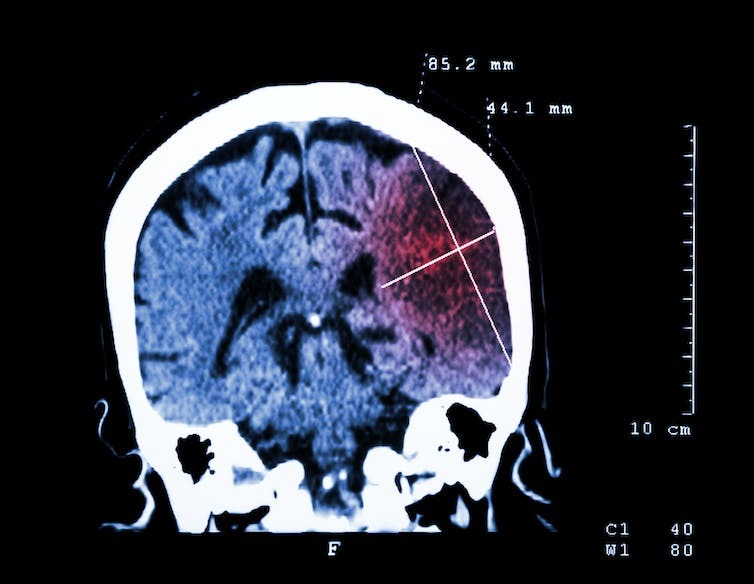 How does brain injury affect memory? Memory difficulties are common after acquired brain injuries such as a stroke. Everyday problems include forgetting appointments, names and details, losing track of conversations and misplacing personal items. Research on rehabilitation of memory after brain injury supports the use of compensatory strategies. These include internal or mental strategies such as mentally rehearsing a speech and external strategies, such as calendars, lists, notes, alarms and photos. Traditionally, external memory aids have been in paper-based formats such as diaries and notes, which are bulky and easily lost. Research shows early technological aids such as pagers and Personal Digital Assistants were helpful in approving improving memory function, but unfamiliar and difficult to learn to use for many people with brain injury. Smartphones have the potential to address the limitations of earlier devices. They are familiar to most people, at least in the developed world, and are highly portable. Are smartphones useful memory aids? In both studies, we found that the majority of people both with and without brain injury used smartphones for three main reasons: for communication, as a memory aid and for internet access. When asked about the biggest benefit of using a smartphone, users with TBI and stroke most often cited its helpfulness as a memory aid. This contrasted with those with no history of brain injury, who instead listed portability, convenience and access to the internet as the main benefits. The memory apps used most often by participants with TBI and stroke were calendars, alarms, contacts lists, reminder text messages, notes, cameras, and to-do lists. These apps help the user remember appointments, tasks, details and locations without relying on their internal memory capacity. For people with TBI and those without any neurological conditions, there was no relationship between use of memory apps and performance on objective memory tests requiring recall of a list of words. This suggests that relying on memory aids did not influence intrinsic memory ability. This result was important in counteracting the fear expressed by some TBI and stroke survivors that using a memory aid may make their memory abilities worse, just like using a wheelchair may make leg muscles weaker. Our results indicate that this idea does not apply to memory among our sample group – rather, using memory aids is helpful for people who struggle to remember things by supporting their injured brains without causing any further damage. For stroke survivors, more frequent use of memory apps also seems to be associated with higher productivity, as measured by their engagement in work, study and volunteer activities. This may mean that using smartphone memory apps enabled them to be more productive by supporting them to remember and organise tasks. What are the barriers to using memory apps? In both studies, we found that younger participants were more likely to use smartphones, suggesting that older adults may require more support in using them. TBI and stroke survivors were also more likely to have difficulty learning to use their smartphone, and preferred being directly shown how to use it rather than learning by trial and error. Stroke survivors with motor (physical) symptoms used memory apps less frequently. To further increase access to the benefits of smartphone memory apps, we now need to work out how to help users with brain injuries who may find them difficult to learn. Our future research will aim to work out the most effective methods for teaching smartphone memory apps to people with memory impairment.